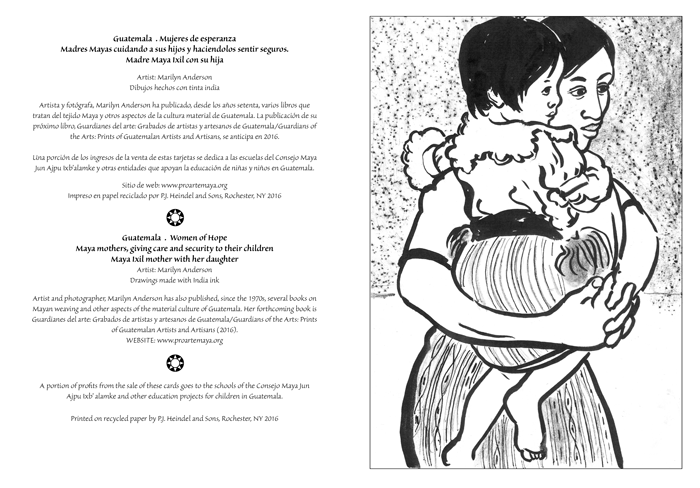 A new note card set of Marilyn Anderson's drawings with bilingual Spanish / English text. The images of the mothers with their children come from different areas of Guatemala. One image of a young girl, caring for her brother and sister was done in a refugee camp in Mexico during the 80s era of brutal war in Guatemala. 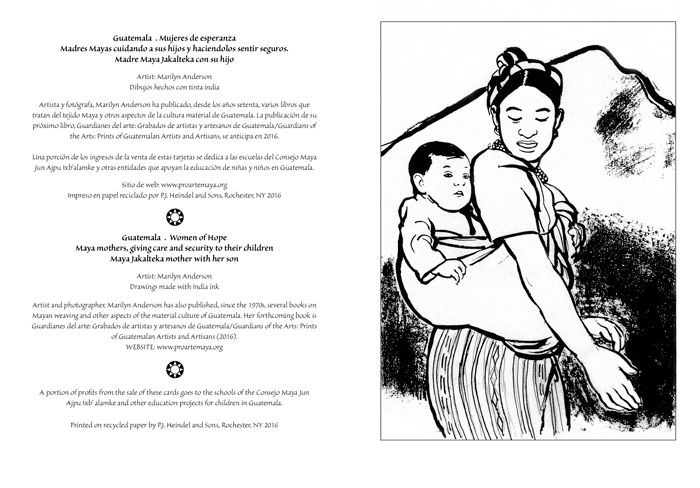 Description: Each set has five note cards, 5" x 7" with images of Maya mothers and their children. They are reproductions of black and white india ink drawings drawings, printed by a union shop on recycled paper, packed in (non-plastic) glassine. Prices: Retail price is $10.00 per set, including first class USPS postage. Wholesale customers should contact Marilyn for prices. Donation: A portion of the proceeds from the sale of these cards goes to the schools of the Consejo Maya Jun Ajpu Ixb' alamke and other education projects for children in Guatemala. For information on purchasing cards, please visit the Ordering page. Click the button below to download the price list and order form.